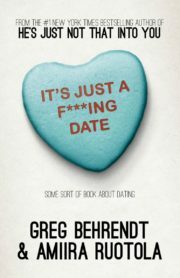 Greg Behrendt is a comedian, author, musician and sometime screenprinter. He’s is the co-author of the New York Times bestselling books He’s Just Not That Into You and It’s Called A Breakup Because It’s Broken, as well as the former host of The Greg Behrendt Show and Greg Behrendt’s Wake Up Call. He has collaborated on all of these projects with his wife Amiira Ruotola Behrendt. Together they have written three books, developed projects for both film and television and co-authored a fashion blog called Outdress The Enemy. Greg currently spends time parenting his two lovely daughters, touring as a standup, recording his popular podcast Walking The Room, and playing with his surf, punk, reggae, ska band The Reigning Monarchs. He some day hopes to lie down. Amiira Ruotola-Behrendt took to writing after retiring from the music business at a young age with little hearing left to speak of. Along with collaborating with her husband Greg Behrendt on He’s Just Not That Into You and co-writing It’s Called A Breakup Because It’s Broken, she also produced The Greg Behrendt Show and Greg Behrendt’s Wake Up Call for television. Amiira continues to develop television sitcoms, writes a fashion blog called Outdress The Enemy (outdresstheenemy.com) and is currently writing her first novel. She lives in Los Angeles and simultaneously raises her two ridiculously incredible children while watching as much tennis as possible when not driving said children to school and dance class. She may or may not have been raised by spies. 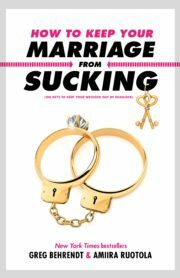 Together, Greg and Amiira have written How to Keep Your Marriage from Sucking, It’s just a F*cking Date, and It’s Called a Breakup Because it’s Broken. They now host the podcast Maybe It’s You and live in Los Angeles raising their two children and three dogs.